"Prologue to Trinity War" - Chapter Two: "Secrets"
Element Woman (a.k.a. Emily Sung), one of three new Justice League members is at Big Belly, a fast food restaurant, picking up treats for the team. She is unaware that the villainous Despero is on a rampage inside Watchtower. From Atom (Rhonda Pineda), who seems to be keeping an eye on her, we get a rundown of Element Woman's abilities, plus some impressions. Emily can transform herself into any of the elements naturally found in the human body; and can shape them at will. Emily cannot assume normal human form. Atom believes Emily is somewhat mentally unstable. It is clear that Atom is correct; and that Element Woman's behavior would be considered childish and inappropriate at times. When Element Woman teleports inside Watchtower carrying the food, she sees Despero manhandling Firestorm and fiercely demanding that the "real" Justice League members (the ones he is familiar with) show themselves. Presently the original members are nowhere to be found. Instead, we have the three new members Element Woman, Atom (who can shrink down and control her size and weight), and Firestorm (who can fly, generate energy blasts, and transmute any inorganic element into another). Firestorm is secretly composed of two high school students Ronnie Raymond and Jason Rusch, melded together to make one hero. Firestorm converts some air in the room into titanium to fashion a vault door to slow Despero down. Firestorm and Atom bicker about what to do next. 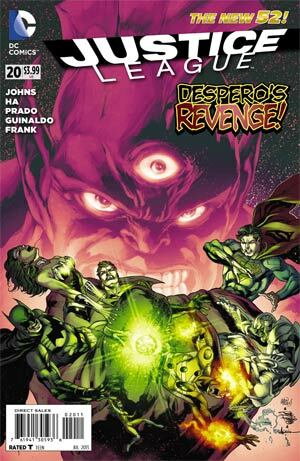 Despero is very powerful, and these are of course the least experienced Justice League members. Firestorm wants to retreat, but Atom wants them to stand their ground. Firestorm reminds Atom that when Despero was defeated last time, the powerful Martian Manhunter was on the team. Atom says "Well we're what the League's got now", asserting that they should take Despero on. Despero crashes through the vault door. He grabs and rips off a large metal chunk from the satellite's interior and hurls it at the heroes. Firestorm converts the huge projectile into snow. Atom considers getting inside Despero's head and attempting to trigger an aneurysm. Despero claims this trick will not work because he is too powerful. Despero breaks the bond between Ronnie and Jason, causing Firestorm to split back into the two young men. Atom is losing confidence, and begins to think they are way overmatched. She wonders where the original team members are. Superman, Batman, Wonder Woman, and Cyborg are together somewhere far from Watchtower. Wonder Woman is still furious that Batman was keeping a chunk of Kryptonite in the Batcave. Wonder Woman is emphatic that they need to find the intruder who stole the Kryptonite. Cyborg reveals that they have a major problem because the Watchtower defense systems are shut off. Batman tells Cyborg to teleport them back to the satellite. Cyborg cannot do that because the coordinates keep changing; Watchtower is falling to Earth. The battle inside Watchtower continues. Despero cannot easily attack the mind of Element Woman, since it is splintered and abnormal. But she is vulnerable to a physical attack; and he strikes her. Then Despero picks up Atom and prepares to pop her into his mouth like an M&M, when Martian Manhunter arrives in the nick of time. He is irate, and challenges Despero. Superman takes off to catch the falling Watchtower. 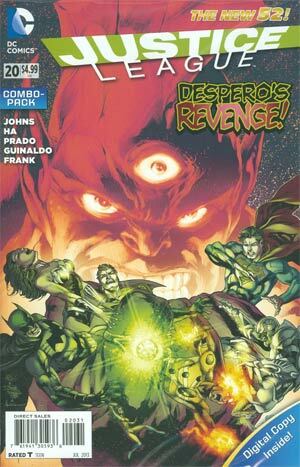 Despero conjures up images of a dying Mars, to somehow demoralize or weaken Martian Manhunter. But J'onn J'onzz is not susceptible, and gets the upper hand. A telepathic attack from Martian Manhunter causes Despero's normal synapse flow to be reversed. This is a knockout blow; Despero may take weeks to recover. Martian Manhunter tells Atom to keep his appearance at Watchtower a secret. Superman does successfully catch the Watchtower, and forces his way inside to ensure that everyone is OK. Spotting the unconscious Despero, Superman asks Atom if she was the one who took Despero down. She fibs and takes credit for it, not knowing what to do. Despero, although unconscious, is wearing a Kryptonite ring; and Superman crumples in pain. When Cyborg removes the Kryptonite, Superman flies near the sun to recharge. Batman admits that Despero's Kryptonite was obtained from the Batcave. He says that he had it in order to find a cure for Superman. But Wonder Woman and Aquaman suspect the truth; that Batman is lying, and was holding the Kryptonite to use against Superman if he ever felt it necessary. At dawn, Superman visits Batman at the Batcave. He questions Batman about the maze of lead pipes in the walls; realizing that they are there to block his X-ray vision. Superman originally gave Batman the Kryptonite to use in case Superman went rogue or was under mind control. But Batman has taken it much further; and has prepared a separate box for each hero. Each box contains the means of taking a hero down if necessary. Batman opens the Wonder Woman box to show Superman that it is empty, because she has no Achilles' heel. Superman is essentially the "box" for Wonder Woman; the only one who can stop her. This is why Batman is so concerned about the Superman/Wonder Woman relationship. Batman is counting on Superman to stop him as well, if it ever comes to that. Batman hands Superman a box with the bat-insignia on the cover. Superman opens it, and is shocked by what he sees; although we never see the contents. Batman says "If you ever need to - If you're truly my friend - You'll use it". We learn that Atom has been acting as a double agent; and has been spying on the Justice League for Steve Trevor and Amanda Waller. She is speaking to them, and expressing her extreme reluctance to do their dirty work. They tell her she has no choice; implying that they have some sort of hold over her. Rhonda is very upset, saying the Justice League members are "really, really nice people". Everyone in the Justice League is asking how she defeated Despero; and she has no idea what to tell them if she is forbidden from telling the truth. Rhonda tells Steve and Amanda that someone hacked the Justice League computers and stole their files; and that someone stole Kryptonite from the Batcave and gave it to Despero. Steve asks her to persevere in her role as spy, and to bring back some intelligence about Element Woman and Firestorm. Rhonda tells herself that the Trinity War is coming. Story - 4: I am a big fan of the Geoff Johns style of storytelling. Johns likes to take his time and let plot details unfold slowly; never rushing or glossing over key story points. He establishes the main conflicts early on, and then builds upon them. This allows suspense to build slowly over time. And any good Geoff Johns story has a strong focus on character development. This issue has all these key elements. We are not yet to the full-blown Trinity War; but we are laying the foundation. One of the main conflicts concerns the moral dilemma that Atom is facing. She has been put in a tough spot, and is not really sure what to do next. Steve Trevor and Amanda Waller are being very unfair to her; forcing her to spy on the other members. It is clear that Atom is very reluctant and feels very guilty. As a new member, Atom feels grateful to be accepted into the Justice League; and is just sick about having to betray the others, who she likes personally. It is not clear how Trevor and Waller are able to force her to do this; but it will become clear over time. I hope (and predict) that Atom will find somebody on the Justice League who she can confide in; and thus turn the tables on Trevor and Waller. Much of the focus this issue is on the three new members; so let me give my impressions of them so far. Atom strikes me as being intelligent, brave, resourceful, and sadly, wracked with guilt. Her courage and quick thinking make her a natural leader. I was impressed that she wanted to hold her ground against Despero when Firestorm wanted to retreat. I liked her quick thinking, guiding Firestorm during the battle. I hope that Atom can resolve her personal conflict and find a way to stay on the team. She could potentially be a very valuable member. Something about Atom in this issue gave me a chuckle. As someone who read and enjoyed Atom comics (Ray Palmer) during the Silver Age, I recall that a classic maneuver was for Atom to dial the phone number of someone he wanted to visit, and then travel practically instantaneously by shrinking down, jumping into the mouthpiece of the phone, and using the phone wires to travel really fast. I got a kick out of seeing that this maneuver has been updated for the 21st century; as Rhonda uses her smartphone for travel now. Nice touch. Element Woman is at the other end of the spectrum from Atom. She is weird and a bit dotty. I cannot figure out why the Justice League brought her in. Didn't their vetting process reveal that she is a little nutty? She was selected over the other recruits who tried out in issue #18? She is a better choice than Black Canary, Vixen, and Zatanna!? Really!? I got a kick out of seeing Element Woman pick up food for everybody from Big Belly. That name is a hoot! I presume that Emily did this on her own, without being asked. That gesture is at once thoughtful and yet bizarre. Just imagine Batman sitting down to enjoy his "strawberry-banana twister shake". LOL. Not only is Batman perhaps the richest man in the world, he is a health and fitness fanatic. I imagine a typical meal for Batman would consist of the healthiest foods you can find: whole grains such as brown rice, quinoa, or buckwheat; protein from tofu or salmon; Cruciferous vegetables such as fresh broccoli, cauliflower, or kale; strawberries or blueberries on the side; and green tea to drink. I am pretty sure he has never had a Big Belly burger or a milk shake in his life. Ha. Element Woman's comment to Firestorm that, "You could breathe me if you need to" was really out there. My guess is that Element Woman will be used as Comic relief, much the way Plastic Man was used in the past. Firestorm is potentially one of the League's most powerful members; but his inexperience holds him back. He needs some training. I expanded on this topic at great length in my review of Justice League #18. Take a look. It was amusing seeing the three newest members in battle against Despero, a very dangerous foe. They were of course seriously overmatched; so it was Martian Manhunter to the rescue. It is ironic that Despero never got to confront the heroes he was looking for. He particularly wanted to give Superman a dose of that Kryptonite ring. At the Batcave, We see Batman tell Superman at length why he has strong reservations about Superman's relationship with Wonder Woman. But I believe that to some extent it is a smokescreen. I believe Batman's main reason is extreme jealousy. Bruce would prefer to be the one spending his nights with Diana; but Batman would never admit this. Art - 3: The artwork is satisfactory, but not spectacular. 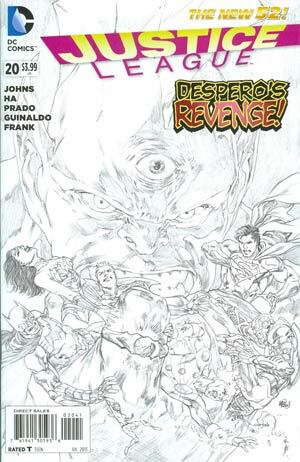 I look forward to the return of Ivan Reis. Billy Batson still has his mouth covered by Black Adam; and still wishes he had confronted Black Adam in his alter ego as Shazam. Via the magic lightning, Billy sees scenes from Black Adam's origin. We get to follow along. We learn what we already suspected; that Black Adam has been sinister and ruthless from the very beginning. Billy's siblings see that he is being manhandled by Black Adam. In desperation, they commandeer a garbage truck and ram it into Black Adam. This provides the necessary distraction, and Billy is free from Black Adam's grasp. Billy immediately says the magic word and transforms into Shazam. He tells Black Adam he will not be afraid anymore, and will stand his ground. Black Adam grabs Mary and Freddy by the throats, and tells Shazam to cooperate or they will die. Story - 4: This story has been marching along slowly for over a year. We have learned much about Billy and his relationship to his new family. We are finally ready for the epic confrontation between Shazam and Black Adam. Will Mary and Freddy get their powers now and join the fight against evil. We will see in issue #21. I have enjoyed this series immensely, and am looking forward to the epic conclusion next month. After that, I hope Shazam gets his own book. Art - 4: Gary Frank continues to do a great job with this series. Cover Art - 5: This is a very strong cover. A gigantic Despero holds the Justice League members in his clenched fists as they squirm to escape. The glowing Kryptonite ring casts a sickly green pallor in the foreground while the snarling face of Despero provides a contrasting subdued red hue in the background. Cover Art (Variant Edition) - 4: This action shot has a lot of energy and implied motion. 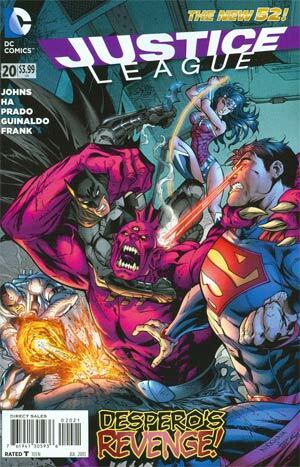 Despero is in the center as Superman, Wonder Woman, Cyborg, and Batman attack with heat vision, a magic lasso, energy blasts, and a good old-fashioned wrestling hold. Despero struggles to escape; and you get the feeling that he will soon wriggle free.